The number of international students studying in the US in 2014-2015 increased by 10%, the largest growth the country has seen in more than three decades. International students on US campuses now total 974,926 students with international enrolments at eight institutions across the country exceeding 10,000, according to the Institute of International Education’s 2015 Open Doors report on international education. The report also shows that more students from the US are going overseas as study abroad numbers increased by 5% from last year. 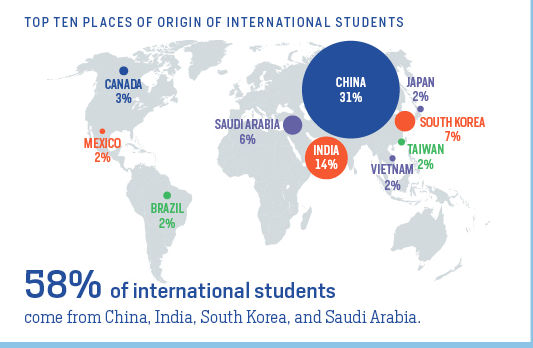 China maintained its position as the largest contributor of international students, making up 31% of total international students in the country. During 2014-2015, 304,040 Chinese students studied in the US, a 10% increase on the previous year. However, India is the true growth story this year with numbers increasing by almost 30% to reach 132,888 students, mostly seen at the postgraduate level and accounting for 14% of total international enrolments. “We know that Indian students have always been very attracted to the availability of excellent science and research facilities on UA campuses and also within the US industry, which Indian students really view as being a leader in innovation, research and development as compared to any other destination in the world,” commented Rajika Bhandari, IIE’s deputy vice president of Research and Evaluation. She added that Indians are drawn to the US because of the large and growing Indian diaspora in the country as well as the rupee’s recovery after steep devaluation three years ago. Brazil also saw big growth, 78%, totalling 23,675 mostly thanks to government funded scholarship programmes. South Korea remained the third largest contributor of international students, 63,710, however numbers continue to fall, down 6.4% in 2014-2015. Saudi Arabia, up 11%, was the fourth most dominate sending country accounting for 59,945 enrolments. “We are excited to see that record numbers of students are taking advantage of international education opportunities. We applaud the efforts of US higher education, as we work together to welcome more international students to our campuses, and to increase the number of American students from diverse backgrounds who study abroad,” said Assistant Secretary of State for Educational and Cultural Affairs, Evan Ryan. New York University, University of Southern California, Columbia University, Arizona University, University of Illinois Urbana-Champagne, Northeastern University, Purdue University and UCLA all hosted more than 10,000 international students last year. Meanwhile, according to data collected by NAFSA, international student spending totalled $30.5bn and supported more than 373,000 jobs to the US economy during the 2014-2015 academic year. This is a 9.8% increase in job support and creation, and a nearly 14% increase in dollars contributed to the economy from the previous academic year. Outbound students continue to be attracted mostly to European countries as figures show top destinations, the UK and Italy, were each up 12% and 10% respectively. After Europe, Latin America and Asia were the most popular regions for outbound US students to study led by China, despite a 4.5% drop last year and Costa Rica, up 1%. “It is critical that we continue to make study abroad more accessible. These exchanges strengthen ties between the United States and countries around the world. By increasing accessibility to study abroad, we are investing in our future and providing a forum to solve global challenges,” commented Ryan. This week the US State Department will launch its study abroad website to accompany the study abroad office it announced earlier this year. The website will bring together study abroad resources and provide information on Gilaman scholarships for students with low financial resources and the Critical Language Scholarships as well as about other non-US government funding.